If your looking for a comfortable holiday home then you have found it here. The property has been well appointed with excellent furnishings and has all the extras to make that stay top class. The main bathroom with its spa bath is to die for as with the well appointed kitchen. Then you have this north facing great deck looking out across Otumutu Bay and the BBQ there awaits your tender steaks! Or if you really feel like being pampered its but a 100m walk along to the world class SOLITAIRE LODGE with its culinary delights. The hot water system is gas so this is unlimited and the water source comes from the best spring at Tarawera! (The water is a treat in itself). Bring your boat and launch across the bay at the Bayview Road boatramp then simply tie up to your jetty with the knowledge that your boat will be completely safe in all winds. This jetty is 100% owned by the property. A highly recommended delightful property and one you will want to return to time and again!! The layout of the bedrooms is described here as the standard template does not allow this. The Master Bedroom has a Double King bed, Bedroom 2 has 2 Double Bunks, Bedroom 3 has 1 Double and 1 Single Bunk, then there is the new additiion with the Bunkroom converted unlined garage with a carpeted floor, and this has 4 bunks. There is a DVD/CD Stereo player available as well as an iPod 4 or docking station. BOOKING PRICE IS FOR 6 PEOPLE. AN EXTRA NIGHTLY CHARGE OF $25 PER PERSON PER NIGHT OVER 6. NO SMOKING INSIDE THE BUILDING AND PLEASE PICK UP ANY BUTTS. PETS MUST BE KEPT OUTSIDE AT ALL TIMES AS WELL THANKS. THERE IS A DEGREE OF FLEXIBILTY WITH ARRIVAL AND DEPARTURE TIMES, BUT DEPENDING ON THE BOOKINGS. ASK THE MANAGER. The garage has been converted into a sleepout with 4 bunks and carpet on the floor. This area tends to be cold over winter months but there is a heater in there. A generous pantry but of course you do need to bring your own food. Perfect for multiple people we had 11, sleep out needs work as suggested in description but once this is done it will be an amazing stay! Would love to stay again once sleep out has had a reverb! The house was great for the families that stayed and the bunks were great for all the kids. The house is absolutely superbly equipped in the kitchen and our weekend was great. The only reason I haven't given this 5 stars is because when we turned the spa bath on a lot of green algae-type stuff came out of the jets and we had to do some scrubbing before re-using it. I would still recommend this property to everyone. Great place for a family get together. Very comfortable house with everything we needed. The house is very comfortable. Three bedrooms inside and an outside sleepout. 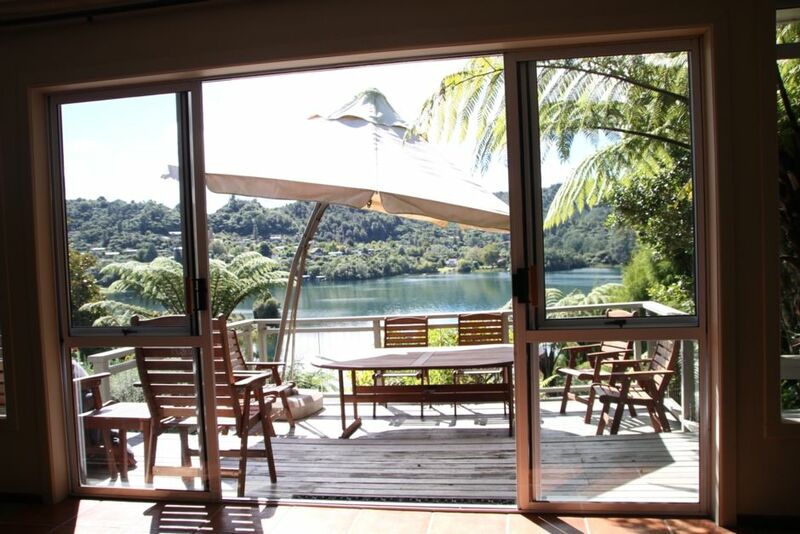 Spacious living areas look out onto a deck and views of Lake Tarawera. We loved the walk down the steps to the lake edge. Great that you can keep your boat at the jetty. Kitchen is well equipped and makes it easy to cater for a group. Awesome stay with your own lake access was the winner for us! Kindly supplied kayak & row boat complimented our own paddleboard & kayak nicely! Probably recommend a "how to folder" rather than notes placed around the house. We had an issue with not receiving entry instructions but was promptly dealt with by Norman. The cleaners are excellent too - we left some expensive jewellery under a bed, located and again promptly returned!! Thanks for great experience! A great well equipped & comfortable home for a large group and having a safe jetty to leave the boat in overnight was real bonus. Main areas - kitchen, bathrooms, bedrooms & living area all clean & tidy on arrival. THE ABOVE LOCAL SERVICES ARE ABOUT A 10K DRIVE INTO ROTORUA.